How Did Jesus View the Jews? Do Lutherans Use the Rosary? Q: I have a set of rosary beads that were given to me as a gift. Are there many Lutherans that use the rosary on a daily basis? I have found Lutheran prayers for rosary. Does the LCMS support the rosary or discourage its use? A: I don’t know how many regularly (or irregularly) pray a form of the Rosary. The Lutheran Church — Missouri Synod has no set position on rosary beads nor on many other aids to prayer and devotion. They are fine for those who use them correctly and not good for those who misunderstand or misuse them. 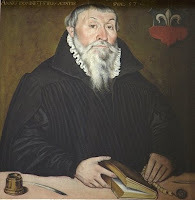 Evidently, Lutheran theologian Martin Chemnitz, the gentleman pictured here, placed himself in the former category and utilized this aid to prayer. If you want suggestions for prayers, check out A Lutheran Rosary [PDF] from Darrel E. Paul. More links and some interesting commentary are available at Prayer Beads, Rosaries, etc. etc. ... and the Lutherans from Confessional Lutheran Ecclesiastical Art Resources. For my previous comments relating to religious art and the Second Commandment, please see Crucifixes and Graven Images. article 20 of the Augsburg confessions explicitly list rosaries among "childish and useless" practices advocated by papists, along with monasticism, lay societies, fasting, and pilgrimage. if the LCMS holds to the confessions, doesn't this mean that their official position would then be that praying the rosary is "childish and useless"? In article 20, other things are also listed, including celebrating 'particular holy days' and taking part in lay societies. Would this be including LWML (Lutheran Women's Missionary League)? Or a holy day like Christmas, or Epiphany, or All Soul's Day? These things are not "childish and useless". If a Lutheran or Anglican rosary is utilized in the ways that are suggested for use, these items can be a very useful and helpful thing for prayer. Fasting can also be an extremely useful, spiritually centering practice.